It took about ten minutes after starting our hike up Volcano Acatenango to decide that this was a terrible idea that was all going to go horribly wrong. Similarly, it took about ten minutes after gratefully returning to the paved road the next day where a van was waiting to drive us back to Antigua to decide that it had all been worth it. Every moment in between? Well, it was characterized by one of those two extremes. My emotions spent most of the two day/one night trek up Volcano Acatenango mirroring the rumbling Volcano Fuego that we observed during our hike: times of peace and quiet followed by boiling frustration and occasional eruptions. Hiking Volcano Acatenango rewarded us with some of the most fascinating views that we have ever seen. 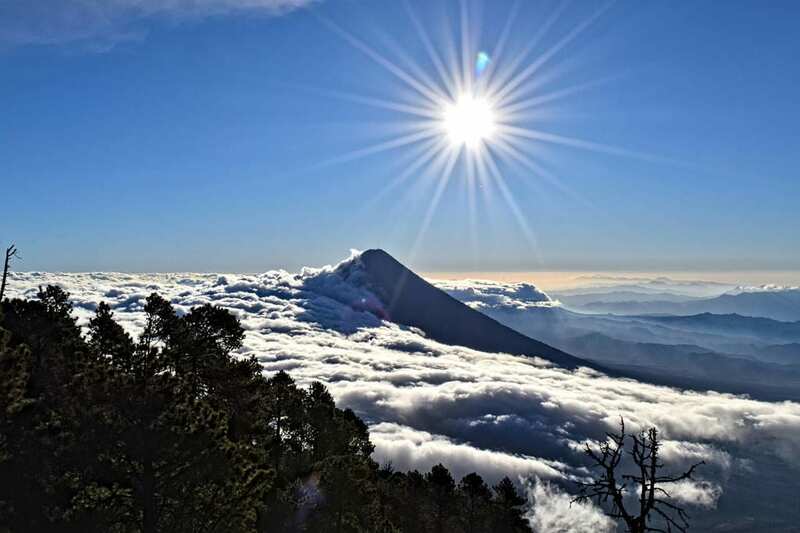 The hike leads tour groups up Volcano Acatenango in search not only of a summit and sweeping views of the region but of an up-close-and-personal look with nearby and very active Volcano Fuego. Several hours into our hike, as we were approaching the campsite, our small group that was hiking Volcano Acatenango together caught our first sight of Volcano Fuego sending billows of smoke into the air–at that moment, all pain and exhaustion were forgotten, and you could literally feel the energy shift to pure excitement. I will never forget that moment–and not just because it provided the adrenaline needed to finish the hike without pain. Our campsite was set up directly in front of this neighbor, which was happy to cooperate with us. While some tour groups have had disappointing experiences due to a quiet Volcano Fuego or cloudy weather obscuring the view, we were greeted with often clear views of Volcano Fuego and so many eruptions of smoke and fire that I lost track. It was easily upwards of 10 times that we saw Volcano Fuego in action, and that’s not even including the deep groaning of the earth that we could hear at night when trying to sleep. Both sunrise and sunset were incredible to behold, and we found ourselves snapping photo after photo in an effort to capture the beauty. 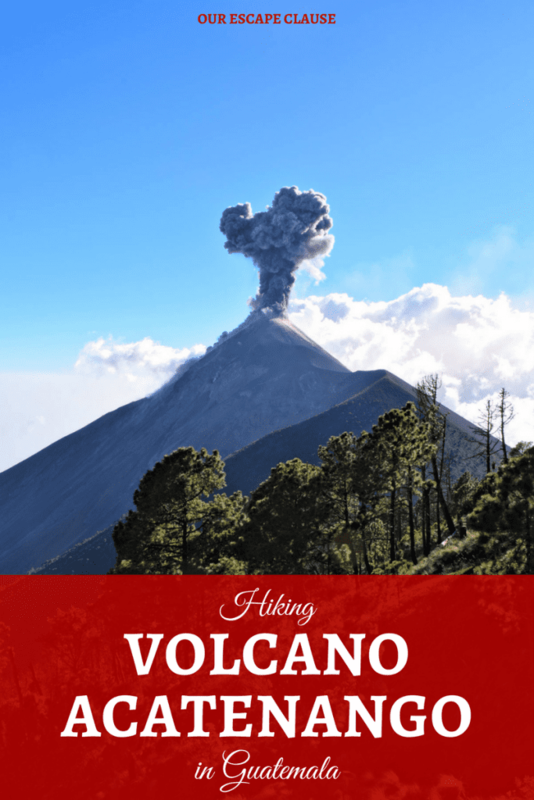 We hiked Volcano Acatenango with a tour that we booked through our hotel. As in many places around the world, our actual tour group was a hodgepodge made up of people from several booking agencies–and luckily, they were all wonderful. 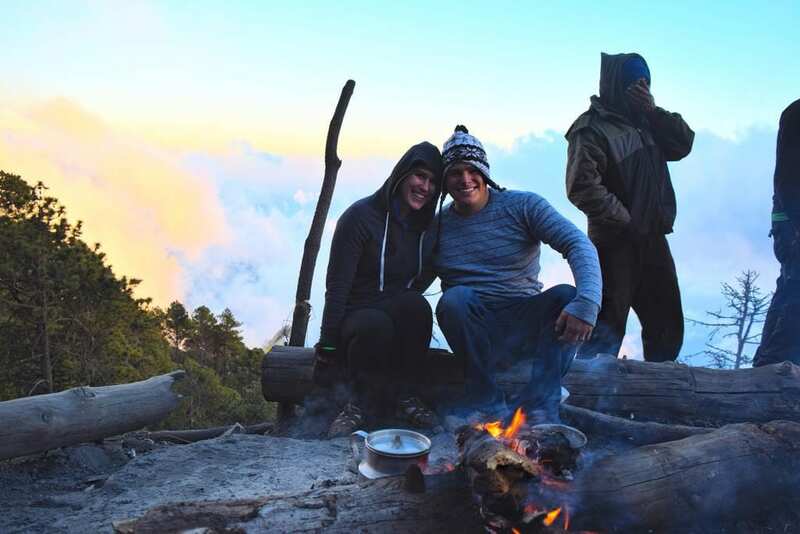 Group trips are always enhanced when the people get along, and we loved getting to spend portions of our time hiking Volcano Acatenango (not the mention the time around the campfire at night) getting to know people from all over the world. Without a doubt, hiking Volcano Acatenango was one of the most physically and mentally challenging things that we have ever done. Harder than a 14-mile day hike in the Grand Canyon, harder than our challenging hike in Slovenia, harder than summiting a 14,000-foot peak in Colorado. The altitude, the incline, the loose pebbles and dirt that made up large swaths of the trail, and our particularly fit group members all contributed to the physical and mental challenges. My pride was injured more than once, due both to being slower than I like to consider myself as a hiker and also due to falling more times than I care to remember on the way back down. As I type this, I can see scrapes on my hands from catching myself several times. The worst sting of all? Jeremy and I missed summiting Volcano Acatenango by about 200 meters of incline. While we’ve decided to let that go and consider the challenge complete, we are not thrilled with missing the official mark. While the guides with us while hiking Volcano Acatenango were kind, the actual organization of the tour made the entire experience less pleasant than it had to be. This tour is advertised around Antigua as including 3 meals (lunch/dinner/breakfast), guides, sleeping bags, sleeping mats, and tents. Beyond that, though–your information will vary. We had group members who were not told that they would not be provided with a bag to carry their gear, so ended up strapping sleeping bags to their day packs. We had group members who were not told that the “meals” were more like “snacks” and that hikers needed to be sure to pack plenty of food of their own. We had group members (us!) who were not told to bring a flashlight or headlamp for the final portion of the hike before dawn, and therefore missed the summit (yep–it wasn’t physical strain that prevented us from going to catch the sunrise at the summit, but the fact that it is literally impossible to climb a volcano when you can’t even see your hand in front of your face). Something all of these miscommunications had in common? 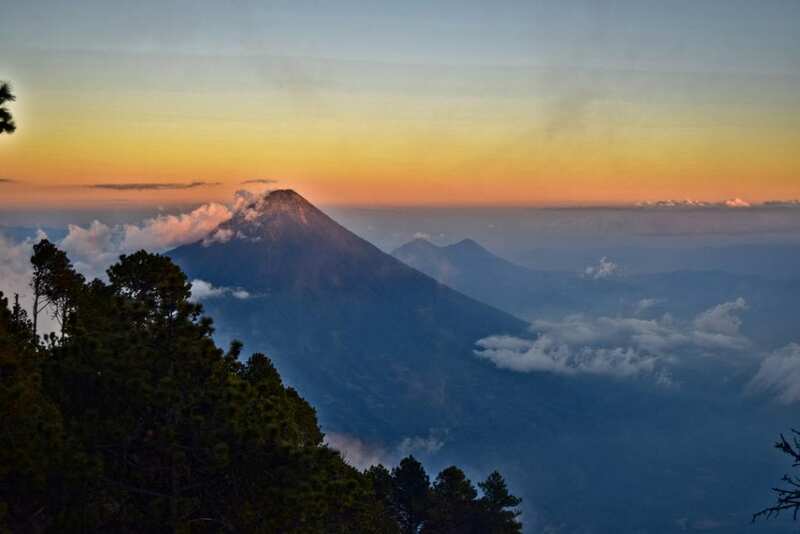 The only people who heard about what was actually the case were those who knew to ask those specific questions–for example, Jeremy and I clarified the food situation after I read an account of the hike up Volcano Acatenango from The Girl and Globe. Even worse, in my opinion, was the lack of safety precautions. Yes, tents, sleeping bags, and mats were provided as advertised–but the sleeping bags were all different weights. Despite the near-freezing temperatures at the top of Volcano Acatenango in January, Jeremy and I were both given summer-weight sleeping bags. To add insult to injury, the zipper was broken on Jeremy’s and it refused to stay closed all night. 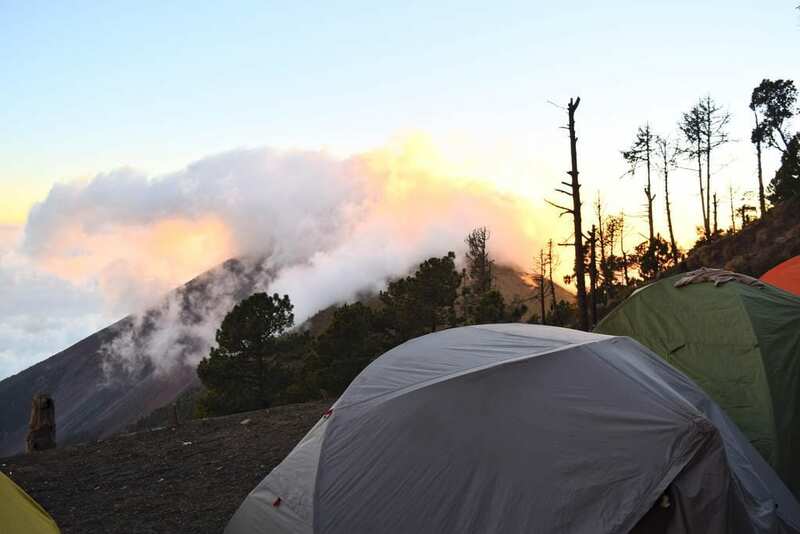 It made for a very uncomfortable night–and a pretty concerning one, once we learned after the fact that six people had died of hypothermia while hiking Volcano Acatenango just weeks before our hike. There are a few tour companies in town that cater to higher-end travelers who book in advance (OX Expeditions is a popular choice)–the price much, much higher for a similar experience (and we can’t recommend any companies personally), but we have seen some people leave much more satisfied with their attitude toward safety. 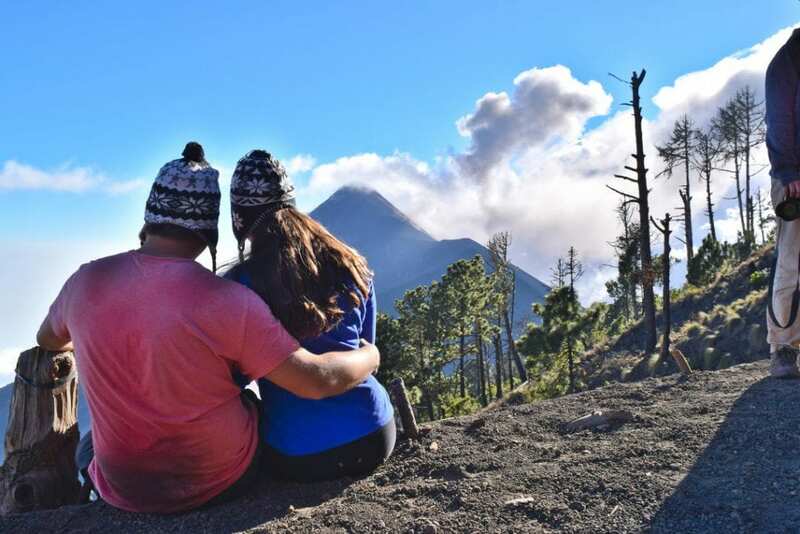 While the experience and views that we had near the top of Volcano Acatenango were incredible, this was easily filed under the “Yeah, it was amazing, and we are never doing it again.” group of activities. Outside of the views of the eruptions and the sunrise/sunset, the Volcano Acatenango hike itself and surrounding landscape were not incredibly beautiful–it had a certain charm, but for as much effort as it took to reach it–I’ll take majestic snow-capped mountains over quirky volcanoes any day of the week. Headlamp — A headlamp is absolutely essential to hiking Volcano Acatenango–without one, you’ll probably end up not being able to reach the summit in the morning! It still stings a bit that we made this mistake. Several Layers — It is cold on top of Acatenango! Bring several layers–we had 3-4 each and were still freezing during the night. Gloves — Both to prevent blisters and to keep you warm–I barely took mine off for the 24 hours we spent on the volcano. Warm Hat — You don’t want to end up summiting without one–ours made the evening so much more comfortable–but I will say that our $1.40 hats that we purchased at the base of Acatenango are still some of our favorite travel souvenirs, so it’s up to you if you want to buy a hat in advance! Hiking Boots — Learn from my mistake: bring. hiking. boots. Not hiking sandals, not casual walking shoes. Boots. You can get away with sneakers if you need to, but your hike will be infinitely more comfortable if you bring boots. Plenty of Food — Unless you book with a luxury company, the “meal” provided for hikers on Acatenango are really more like snacks: be sure to bring enough water and food that you can sustain yourself comfortably during intense hiking. Walking Stick — You don’t necessarily need to purchase this ahead of time, but be sure to rent one at the base of the hike before starting your climb! Hi! Which company did you use? That’s a great question and honestly, I don’t know. We booked through our hotel (La Dolce Vita, which I highly recommend for those on a mid-range budget like us), and ended up with a group that was made up of people who had booked at hotels, hostels and travel agencies all over town. We’ve found that’s a pretty typical experience with tours in the developing world–no matter who you book with, you’re essentially buying the same experience. We paid 150 quetzales per person, our group members paid between 140-300 quetzales per person. I do recommend waiting until you’re on the ground to book–the companies that offer booking in advance charge a lot more for the same experience (I recommend taking a look at the post from The Girl and Globe–she went with a well-known company and ended up with many of the same concerns). Check back on the blog in a few days–I’ll have a post coming out with all the things you should know before the hike. If you’re planning to hike in the next few days, email me through the contact form and I’ll be happy to send you a copy of the draft of the post. I have heard good things about Quetzaltrekkers in Nicaragua (both preparedness and their non-profit aspect), and to be honest, I didn’t even know they were in Guatemala. That is definitely good to know. I hope you have a blast in Guatemala! Great read girl. Just got down from the trek and this made me laugh alot! Aw, thanks so much! Comments like this make my day. Hope you got some clear views of eruptions up there! Same here, recovering today from the hike of Acatenango. Your blog mirrors how I felt over the last two days. 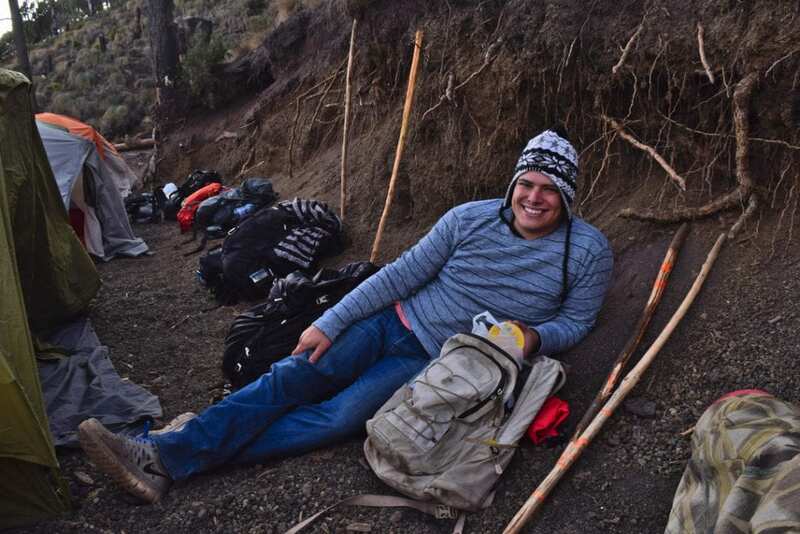 What a range of emotions, from watching fiery Fuego at base camp to summitting Acatenango, to sitting on the ground after your 20th fall climbing down the mountain, fighting back tears. The memories will be with me forever…. They definitely will!! To this day, Acatenango is one of our most well-preserved memories of all our travels–it sticks with you. Range of emotions is definitely the right word for it! Hey, what a great article! I did the same hike as you guys, but went with OX Expeditions and highly recommend them. They were more expensive but the whole trip was very professional. We had a pre-trip meeting the day before and they told us EXACTLY what it was going to be like, they lent us high quality gear at no extra cost, had English speaking guides etc etc but what I felt the real difference was reading your article is that they actually cared about us and giving us a memorable experience. Anyway just thought I’d give them a shout out here as I experienced none of the issues you guys did! Thanks Ben, good to know! I’ve heard good things about them too.